I’m giving away one free private cooking lesson to a winner who can attend the lesson in Anchorage, Alaska. The winner will be able to choose the class s/he would like to take. My primary areas of expertise are: Mediterranean food (Greek, Italian, French, Spanish, Turkish, Middle Eastern, Moroccan, North African), wild foods, foods from farmers’ markets, vegan and vegetarian cooking, basic cooking skills (including knife skills), and all types of baking. I’ve also done Thai, Vietnamese, Chinese, Mexican, and miscellaneous other styles of cooking. For those who don’t know me, I’m a food writer, cook, recipe developer, recipe tester, and teacher. Looking only at the last two years, I’ve written articles and tested/developed recipes for Rodale’s Organic Gardening magazine, Alaska Home magazine, Bob’s Red Mill website, and the Alaska Public Media/Town Square 49 website. I’ve appeared in cooking segments on the Alaska ABC affiliate and the Alaska NBC affiliate, and have taught classes for the Alaska Culinary Association, SBS Bon Appetit Gourmet Cooking Series, Alaska Botanical Garden, OLE! (Opportunities for Lifelong Education), and private clients. I edit and publish LaurieConstantino.Com to provide food lovers everywhere with recipes and resources for making great food. The 2nd Rev. Ed. 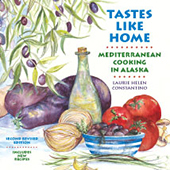 of my cookbook, Tastes Like Home: Mediterranean Cooking in Alaska is for sale online or at local bookstores. 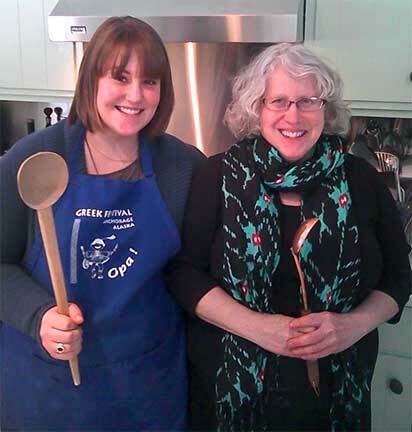 Currently, I’m developing and testing recipes for a new cookbook about Greek home cooking. I do private cooking lessons in my kitchen for one person or group lessons for up to four people. If you want me to teach at your house, which I’ll do, larger groups than four are fine. I charge $50 for each 2 hour lesson per person, which includes food, whether it’s one person or four people (in other words, it’s $50 for one person and $200 for four people). The classes can be done at any mutually convenient time. If you’re interested in cooking classes, please email me at laurie@laurieconstantino.com. The winner has been selected, and this Giveaway is now closed. Congratulations to Wendi Gratrix. The list of past Giveaway winners is available here.